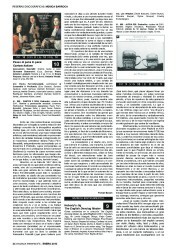 FIRST REVIEWS OF OUR NEW RELEASES! In the last days we have begun to receive the first reviews of our latest releases. Please find below a selection of some of them, appeared in Spain. Under each image you will find some highlights translated into English. We shall be adding more translations in the coming days, as well as reviews appeared in other countries, as soon as we get them. Watch out: this is not “yet another” album of baroque arias, like many nowadays. 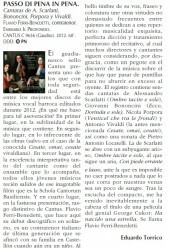 It is the presentation of FFB, who will be soon a big star of early music. FFB has everything in order to succeed: a consistent countertenor voice which he can use with precision and huge expressivity, and, moreover, has a beautiful colour, so much more personal and attractive than that of many other countertenors who have a flat, white, effeminate voice. 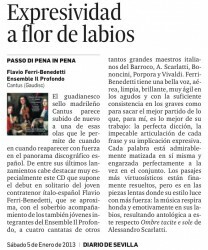 For this CD, his debut as a soloist, FFB has perfect allies in the Ensemble Il Profondo, very refined and with a beautiful sound in the instrumental moments. 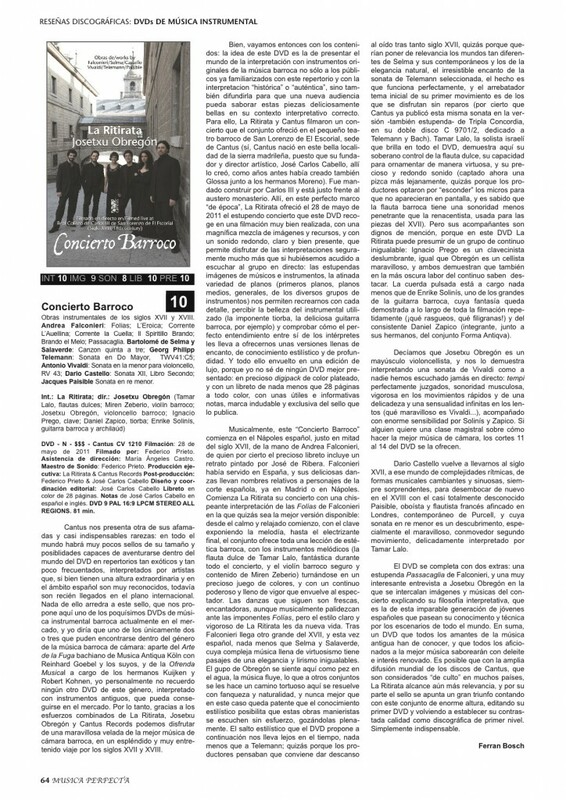 This Ensemble usually invites the soloists they want to work with, not the other way around: their work for years with Ferri-Benedetti translates into a natural feeling and a mutual knowledge that makes everything sound exactly as expected: with precision, firmness in the quick passages and endless sweetness in the melancholic moments. 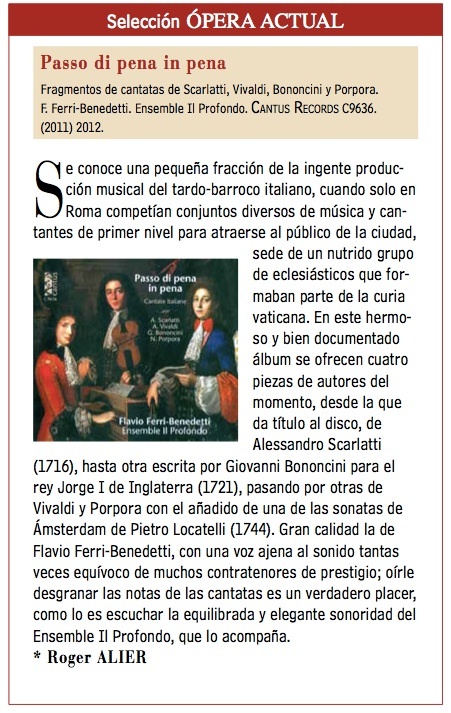 As an example, play the first track of the CD and let yourself fall in love (be enraptured): the prodigious instrumental introduction to the Scarlatti cantata is performed in an amazing way — followed by an impressive messa di voce with which FFB underlines the great singer that he is. 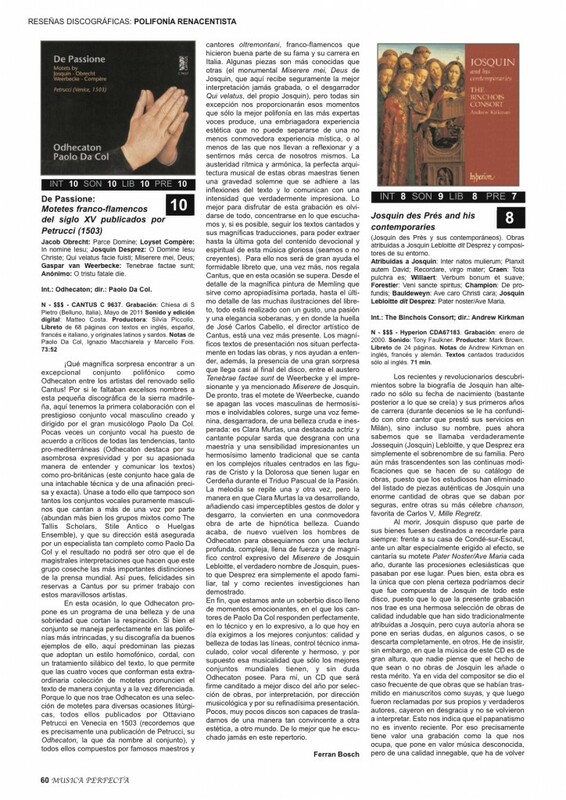 From here on, we are facing one of the best, if not the best album of Italian cantatas recorded to this day: there haven’t been Italian countertenors among the “big ones”, and it seems like Ferri-Benedetti goes the right way to become it: he has not only the technical quality, but also the logical and natural knowledge of the text, the naturalness of his most beautiful diction and the perfect way with which he gives the exact meaning to each word. […] This album deserves our highest mark: for almost 70 minutes we get a splendid example of the best way to make music: the way that appears when talent, knowledge, capacity and passion come together. It contains endless gems. My personal favourite is the beginning of the CD, of an almost disturbing beauty – but also the final aria of the Bononcini cantata […] sung by FFB with an unsurpassable sensuality. 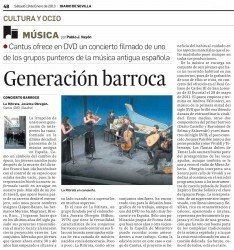 […] As usual with Cantus, presentation and design are marvellous […] the libretto by José Carlos Cabello tells us everything we need to know about the cantatas and their context. 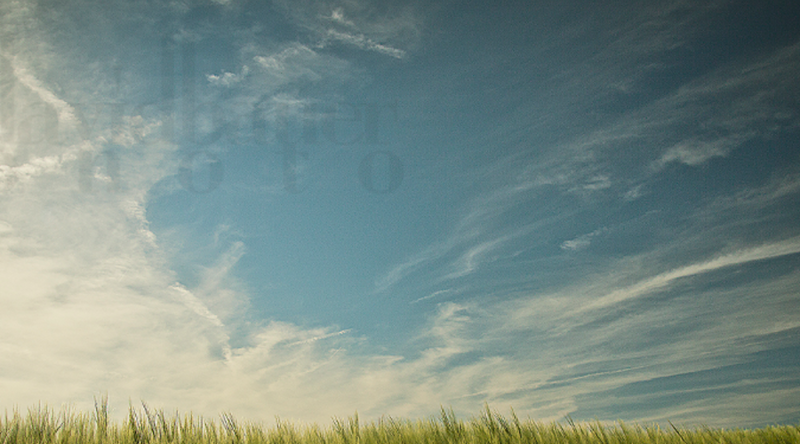 The sound is beautiful […] with very good clarity and strength. […] In short, it is a debut that will be remembered forever, because this album is one of those that receives the adjective of: “essential”. 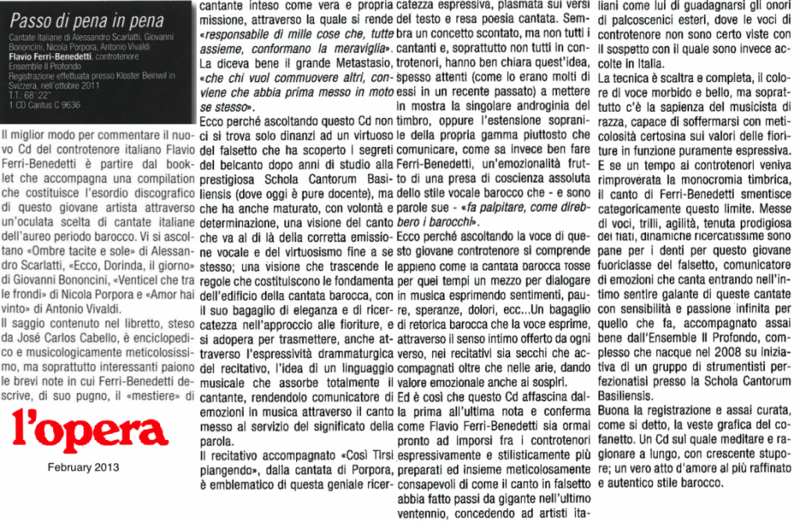 [The singing protagonist of this CD is countertenor Flavio Ferri-Benedetti, who also writes in the libretto his reflections about the phenomenology of singing as the art of linking, moving, enraging, purifying, feeling and being felt. His voice is full of refinement, exquisiteness and sensuality through a very pleasant timbre, secure dynamics and a perfect fiato. The efficient and inspired accompaniment is performed by Ensemble Il Profondo, composed by eight ex students of the Schola Cantorum Basiliensis, specialized in baroque music.